Let your kids explore their creativity at the Michaels Kids Club. Choose from two projects designed specifically for your little maker’s age range. $2, ages 3-8 or $5, ages 6+, supplies are included. This week you’re making Kawaii Canvas Prints! Your kids can build 21st-century literacies this summer with Burlington Public Library’s Maker Buddies program. Through fun hands-on activities led by trained teen volunteers, kids investigate different STEAM (Science, Technology, Engineering, Arts, and Math) concepts each week in a supportive small group environment. Sessions are drop-in with limited spaces available. Feed Your Passion for BUILDING What can you build? Come and create during drop-in Library LEGO! Children 5 and under must bring an adult. All ages. Drop-in to any Burlington Public Library branch to celebrate all the new adventures you’ve had this summer, and maybe have a few more. Family-friendly games, crafts, and activities. Drop in. All ages. Bring your little literature fan to the library for Story Time. 10:00 at Alton, or 10:30 at Central. Grab the popcorn! It’s Family Favourites Movie time at Cineplex. For only $2.99 a person, you can take the fam to watch that loveable bear Paddington. The Winona Peach Festival has something for every age group! Midway rides & games, Arts & Crafts, “Peach of a Car Show”, Commercial Exhibits, free entertainment stage with children’s programs, a huge food court with crepes, cobbler and the famous Peach Sundae (plus gluten free, dairy free options)! Relax with great music in the evenings. It’s Sat-ART-day at Alton library. Grab your friends and family and create some art using supplies from our Loose Parts table. JOIN US for the first author reading of Water Only Please! Written by Camilla Aviss and illustrated by Burlington Central High School graduates Amy Crosby and Michelle Chen. This event is free and includes story time for families, playtime with the Imagination Playground, and visits with Paws for Reading dogs from St John Ambulance. Community Mindfulness Burlington is inviting residents to a series of free drop-in mindfulness sessions in Burlington parks in July and August. The mindfulness sessions are led by volunteers from Community Mindfulness Burlington. Have a blast this weekend, and remember, if you found a new family event because of Active Parents, tell your friends about our page! 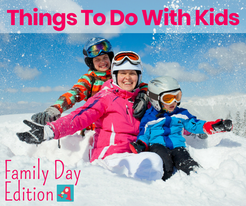 And tag your pictures with #thingstodoinburlon and #activeparentsca to be featured on our social media! We owe the success of this great site to YOU!